Do you have a garage attached to your house? Attached garages have become an increasingly popular feature of American homes since they were first introduced a century ago, overtaking detached garages and carports. They do have a distinct advantage, especially in areas with harsh climates: they protect you and your vehicle from the elements. However beware the dangers that this type of garage may present in terms of poor or even poisonous air quality and fire hazards. Here are 7 potentially dangerous actions -- proceed with caution! If you access your house via a garage entry door, the air from the garage will flow into your home. Watch out for products like old paint or stain, motor oil, pesticide, and the like, as well as gasoline-powered garden tools. All of these can offgas toxic fumes. (Metal cans also rust more easily and their contents deteriorate in quality if they are stored in the variable temperature conditions to be found in the average garage.) Get these things out of your garage. If you really must hang on to them, store them in a garden shed, far from the house. Otherwise, dispose of them via your local household hazardous waste program. When buying a new lawn mower, edge trimmer, etc., go electric. Your garage may seem to be the perfect out-of-the-way spot to install the household water heater. However, if your water heater's powered by natural gas, the burning fuel will give off carbon monoxide, which can get into your home. This is particularly likely when the heater is the natural draft type, rather than direct vent. Use a monitor to detect dangerous levels of CO inside your house -- and in your garage, if it doubles as a workshop, home office, or man cave. In addition, have a knowledgeable professional install an exhaust fan in your garage to create ventilation and negative pressure that will minimize air transfer to the house. On a cold winter morning, warming up your car inside the garage might seem like a good idea. However, leaving your engine running for as short a time as 2 minutes will result in dangerously high carbon monoxide concentrations of 500 ppm in the air ... and that's with the overhead garage door open. The best course of action is to open the garage door before starting your vehicle and then drive out onto the street immediately after turning on your engine. According to building code updates, it is now officially illegal to tie the heating and cooling setup for an attached garage into the same HVAC system which is used for your house. This regulation minimizes the possibility of both the transmission of CO and the spread of fire. If you absolutely must heat and/or cool your garage, install a mini-split air conditioner or a window unit instead. Be sure to take care of the air seal between the garage and your home. The common wall must be well insulated (check that the insulation you use is fire retardant) and the entry door weatherstripped. Should you decide to build a bonus room above the garage, make sure the garage ceiling/room floor is air sealed too. This sealing offers a fringe benefit -- it forms a barrier not only against fumes but also against cold air coming into the house from an unheated garage. Keep the garage floor clean and free of clutter; gasoline and oil leaks, oily rags, loose paper, and similar items pose a fire hazard. Avoid overloading garage electrical outlets. Tape electric wires or cords in place to prevent yanking and twisting. 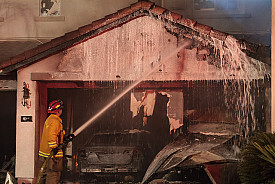 If you do not yet have a smoke detector in your garage, buy one (today! ), install it promptly, and keep it supplied with fresh batteries. And finally, purchase a fire extinguisher for your garage, as well as one for every story of your house.